Yamamoto Noriten: Melt-in-your-mouth delicious seaweed! 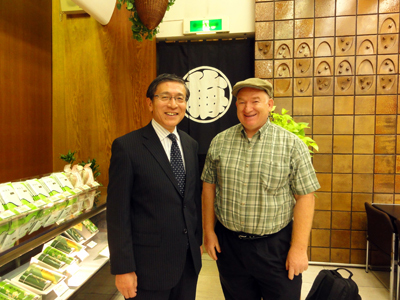 Thayne-san, today the shop we’ll be visiting is Yamamoto Noriten. I know the original shop is right in front of Mitsukoshi, but I haven’t ever been inside. I’m looking forward to it. Hi Thayne-san. I’m Taito Yamamoto of Yamamoto Noriten. It’s a pleasure to meet you, Yamamoto-san. Your shop is wonderful―the high ceiling makes it feel really airy. Thank you. Ever since this shop was founded in 1849, we’ve been doing business in this location. Tokyo’s fish market is in Tsukiji now, but until the Great Kanto earthquake in 1923, the Edo-Tokyo fish market was located right here in Nihonbashi. Fish, shellfish and seaweed from all over the country was brought here for auction. That’s why the first generation chose this spot for their business. As you walk along the street, it might be hard to imagine that this used to be a fish market, but there are other Toto Norenkai member shops who got their start here because of the fish market, including Ninben, Funasa and Kanmo. Incidentally, was nori first made in the Edo Period? Not at all. Nori is listed as a taxable good in the Code of Taiho, enacted in the year 702, and nori appears in Fudoki (ancient cultural and geographical records) collected at the beginning of the 8th century, so we know that nori has been harvested for at least 1,300 years. But it was the city of Edo during the Edo Period that invented the process of spreading the nori thinly, no thicker than a piece of paper, and drying it. Nori was harvested from the sea near Edo, or present-day Tokyo Bay, and processed into sheets that were easy to preserve and eat. In other words, the nori that you and I eat all the time is a product of Edo. Is nori still harvested from Tokyo Bay? It is, but only a small amount. In terms of production and quality, the best nori comes from the Ariake Sea. And the cream of the crop is called “Ariake Ichiban,” from Saga Prefecture. We buy nearly all of the Ariake Ichiban harvested. Wow! I guess that means you always bid the highest at the auction and get the very best nori each time. That’s right. Our reputation depends on it. But what really matters is that we have customers willing to pay for that quality. In other words, your customers trust the discerning eye of Yamamoto Noriten to choose the best product, even if it’s more expensive. Yes, business can be challenging. Of course, that’s what makes it fun as well. Nori has many qualities that people look for, including color, shape, and aroma, but what we value most is whether the nori is tender and melts in your mouth. We often get customers who believe that dark nori is the best, but dark nori is less tender and tends to be harder to chew. Really good nori gently melts away in your mouth, giving off a pleasant taste and aroma. Dark nori with a sheen looks like high-quality, but that’s not necessarily the case. Some onigiri rice balls are wrapped in dark nori, but it can be hard to tear with your teeth. Yes, that’s right. You can’t select nori based on its color. Incidentally, did you know about nori when you were in America? No, actually, I discovered nori when I came to Japan almost 30 years ago. I think I was a bit surprised. Basically, seaweed isn’t eaten in very many countries, and dark-colored foods are also rare, so it makes sense that there are a lot of non-Japanese who don’t care for it. In English nori is called laver or seaweed, and the word “weed” (“zasso” in Japanese) doesn’t give a very favorable impression. I would love for more non-Japanese to enjoy our nori, but that might not be so easy. No problem, just say, “It’s healthy!” and Americans will come running. Ah! Nori is rich in vitamins and minerals, particularly folic acid and dietary fiber, so I guess we should be promoting those qualities more. By the way, Thayne-san, nori goes well dairy products. Are you familiar with “nori toast?” You toast and butter a piece of bread, then eat it with nori on top. You should give it a try. I recommend it for breakfast. Here, try this. It’s a new snack: nori with cheese, and nori boiled in soy sauce (called tsukudani flavored), and then it’s freeze-dried. The cheese-flavored one is really good. The tsukudani flavor looks like it would be great with beer! Since you have such a long history I thought maybe all your products would be traditional, but you’re also introducing new products like these. That’s right. We want nori to be enjoyed in many ways, not just with rice, and for the last 30 years or so we’ve been developing a variety of new products. Our biggest hit so far has been nori chips. Have you had them before? Yes, I’ve had the ume plum flavor. Nori chips are things like ume, barley, and sesame sandwiched between sheets of nori, and cut into long, thin pieces. Our yuzu-honey flavor is selling quite well in Singapore. It’s a little sweet, but in Singapore they don’t have any preconceptions of what nori should be, so people like it. Really. This is yummy, too! 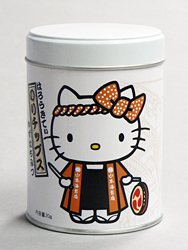 I’ve gotten really used to seeing this design with Hello Kitty. There was one question I really wanted to ask you today. Why do shops that sell tea also usually sell nori? The shop near my home sells both, for instance. You really know your tea shops. It’s probably because both nori and tea are dried goods and their handling is similar, so it’s easy to sell them together. New tea leaves are ready for market in the early summer, resulting in lots of business then, and by the time business slows down. nori is being harvested, and nori sales increase. So the shops have money coming in at different times of the year. I see! But nori is especially tasty from autumn all the way through the winter. Yes. Our trademark is the Chinese character for plum inside a circle. Nori is delicious right at the time plum trees bloom. The trademark was chosen because for both the plum flower and nori, the aroma is valued above all. Wow, that’s the sort of sophisticated logic you’d expect from an Edo Period shop. Thanks so much for your time today.